Chilly mornings call for a hot comforting breakfast. 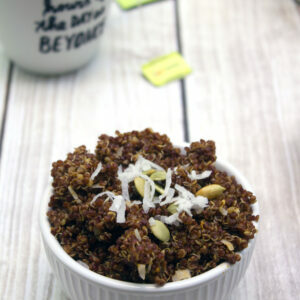 This Chai Tea Pumpkin Breakfast Quinoa combines the spiciness of chai tea with hearty pumpkin and quinoa for a breakfast that will keep you satisfied all morning. In a medium-sized saucepan bring water, chai tea bags, and quinoa to a boil. Lower heat to a simmer, cover saucepan, and let cook until quinoa has absorbed water. Remove tea bags. Immediately stir in pumpkin puree, cinnamon, and shredded coconut. Serve in bowls, drizzling with maple syrup and topping with pumpkin seeds and extra coconut. Breakfast quinoa can be kept covered in refrigerator and be re-heated in microwave.